After mentioning my new toy a couple of posts ago I mentioned I was hoping to do a bit of Android development. I’ve been doing a bit of Android work as part of my new job (I recently joined a very cool team at work) making some existing Java code run, but this is my first real application. I had left the TV on and gone to the office one day last week and while it did not permanent damage, there was a slight bit of ghosting from the MythTV menu for a day or 2 afterwards. I already have my TV hooked up a couple of topic on my home MQTT broker, so I though that running up a simple Android Widget to show the state would be a good starting point. 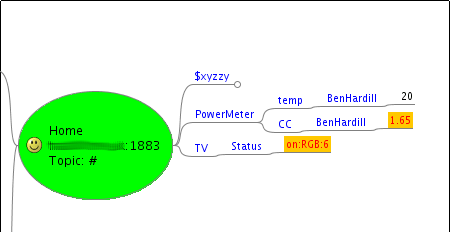 The TV/Status topic updates every 30 seconds and currently shows either off or a string like on:RGB:6 which is made up of state, input and volume. The first task is to create a Android Service that will subscribe to this topic and watch for changes. The standard IA92 MQTT drivers can be used with the Android SDK to get access to the broker, so the connect code is very similar to the code used in my Twitter2MQTT bridge except the id for the client is generated from the phones unique id. The MessageHandler is an inner class and handles both incoming messages and reconnection using the following 2 methods. The MessageHandler onMessage method fires when a message is posted to the TV/Status topic and then updates the widget Icon from tv_on to tv_off and then triggers a notification pop-up if the state has changed since the previous state. The connectionLost method fires up a background thread to try and reconnect to the broker every 10 seconds. At the moment the code does not handle moving from WIFI to 3G networking all that well, there are collection of BroadCast future PendingIntents that should signal changes in network state.